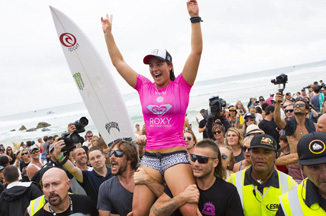 Congrats to Tyler Wright for winning the first Women’s WCT event of 2016 at Snapper Rocks. It was all power all the way to the final including a power packed semi-final vs Carisssa Moore. Also big congrats to San Clemente’s Kolohe Andino who finished runner-up in the men’s WCT final, matching his best result on the tour. Great start to the year for both surfers. Check out some of the video highlights below. Kolohe gets the score in last seconds of round 4 to advance into quarter-finals. Tyler Wright throws down in round 3.